With the MSC Divina's outstanding array of new modern facilities and feature it is now better equipped to more than satisfy the need of their guests. The MSC Divina offers everything you need on board for your dream cruise vacation to the Mediterranean or Caribbean. You have a choice of five on board restaurants, including a delightful Italian steak restaurant. The Aurea Spa offers indulgent spa facilities, including a sauna, steam bath and Thalassotherapy. To regenerate, a state-of-the-art fitness studio, jogging track, five swimming pools and whirlpools are available to enjoy. In the evening, theme-oriented venues like the La Luna Piano Bar or the Golden Jazz Bar away you, followed by a visit to the Galaxy Disco. No matter your budget or needs, you will find the perfect stateroom on board the MSC Divina. The MSC Divina offers everything you need on board for your dream cruise vacation to the Mediterranean or Caribbean. You have a choice of five onboard restaurants, including a delightful Italian steak restaurant. The Aurea Spa offers indulgent spa facilities, including a sauna, steam bath, and Thalassotherapy. To regenerate, a state-of-the-art fitness studio, jogging track, five swimming pools and whirlpools are available to enjoy. In the evening, theme-oriented venues like the La Luna Piano Bar or the Golden Jazz Bar away you, followed by a visit to the Galaxy Disco. No matter your budget or needs, you will find the perfect stateroom on board the MSC Divina. Experience the Caribbean and Bahamas in the epitome of Italian comfort on board the MSC Divina. 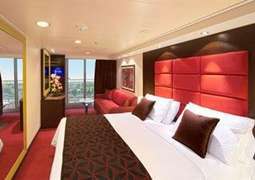 Each stateroom is modern and elegantly furnished, providing a journey both comfortable and chic. 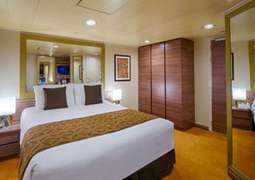 A variety of stateroom options are available, including Interior, Oceanview and Balcony staterooms, luxury Suites, and staterooms for special needs. A gastronomical range of dining options await you on board the MSC Divina. There are two ‘main’ complimentary restaurants on board providing a wide choice of traditional, Mediterranean and international fare made from the freshest of ingredients. For fiends of Mexican cuisine, Eataly Steakhouse is a must – a comprehensive menu serving tacos, burritos, steaks, and enchiladas is complemented by a large show kitchen which provides a truly special dining experience. Sixteen uniquely themed bars and lounges provide the perfect nightcap. A varied entertainment program provides endless fun for both young and old on board the MSC Divina. Kids programs and fun pool zones keep the little ones entertained, while the opulent Casino Veneziano, Broadway-sized Pantheon theatre and incredible real stone piazza provide a world-class entertainment mecca to inspire and delight adults. The exotic MSC Aurea Spa provides the ultimate in onboard pampering. Exquisite treatments inspired by Bali are on offer to provide you with total relaxation and rejuvenation, such as aromatic therapy, Turkish Bath, massage and nail treatments. To keep active, you can take advantage of a bowling alley, volleyball, basketball and tennis courts, shuffleboards and a yoga area. Throughout your cruise on board the MSC Divina, we recommend sporty casual clothing, with a cocktail wear for ladies and suits for men for special evening occasions. MSC Divina is a cruise ship owned and operated by a global cruise line MSC Cruises. Fantasia-class cruise ship was originally named MSC Fantastica while under construction. MSC Cruises renamed the ship to honor the actress Sophia Loren. Exquisitely glamorous and elegant vessel reflects European flavor in its décor and an endless supply of fabulous cuisine, which attracts a mixed clientele of all ages and nationalities. Experience every modern comfort available along with a variety of sports activities, leisure facilities and a top-class entertainment capital at sea. Some spectacular destinations of the Divina include the Caribbean and the Mediterranean region. MSC Divina offers her guests a wide variety of activities, amenities, and entertainment, accommodating all ages and preferences. From MSC Divina’s gorgeous Infinity Pool to opulent Casino Veneziano and the Broadway-size Pantheon Theatre, the onboard experience is awe-inspiring. There are 12 Jacuzzis and an aqua park which boasts 150 fountains and sprays! Guests can also rejuvenate, relax and pamper themselves with a Balinese massage, whirlpool and other available spa treatments. Every evening enjoy live music and lavish Broadway-style shows at the 1600-seat Pantheon Theater. There are two main restaurants on board this elegant cruise liner that offer cuisine from many countries around the world. Alternative dining options include Tex-Mex with an all-day dining menu and a Latin-inspired snacks bar. Experience spectacular views at Villa Rossa Panoramic Restaurant and enjoy fine dining from morning until late. Every stateroom and suite onboard MSC Divina is spacious and combines classic glamour with modern sleekness. Interior and Ocean view cabin’s highlights include satellite TV, a mini-bar, room safe and 24-hour room service. 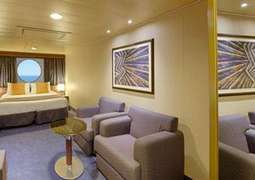 Super Family staterooms feature spacious accommodation for up to 6 people, comprising triple staterooms, two bathrooms and two huge balconies. Impressive Royal Suite is quite simply the place to be on MSC Divina. Spacious, luxurious and elegant, Royal Suite features exceedingly comfortable beds, ample wardrobe and a bathtub.